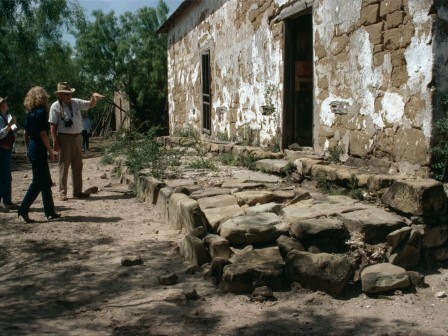 Rancho San Francisco is a 40-acre Hispanic ranching site that includes two native sandstone buildings from the mid to late 19th century. The larger of the structures dates to circa 1850, when Native Americans still closely contested the borderlands, and the second, constructed in 1874, shows remnants of what may have been an original hipped roof with wooden shingles. Rancho San Francisco is significant for the study and interpretation of the Hispanic ranching traditions tied to Mexico, which greatly influenced those in Texas. The majority of its materials are still intact. Its rural wooded setting along the river is reminiscent of the days of an untamed, isolated frontier. Though its condition is now stable, long-term protective stabilization is needed.